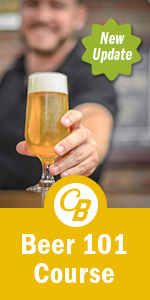 BELMONT, MA – In continuation of its commitment to amazing beer, hospitality, and education, Craft Beer Cellar has launched a new series through their educational platform, The Society of Master Beercierge. Learn Beer is intended to help foster a focus on increasing beer knowledge amongst Boston area industry professionals – servers, bartenders, managers, sales staff, etc. The eight part series, which launches on Monday, September 24th with “The US Beer Industry” and culminates on Tuesday, October 9th with “Sell me a Beer, Geek!”, will take place during weekday afternoons out of respect for food and beverage professionals’ work schedules. Each session of Learn Beer, limited to 24 spaces, is $25, and the series can be taken in whole or a la carte. To find out more about Learn Beer and the variety of other courses and events hosted by The Society of Master Beercierge such as “Intensive Beer Flavor Workshops” and “Malt Sensory Experience”, head to beercierge.eventbrite.com. Craft beer Cellar was founded in 2010 by Suzanne Schalow and Kate Baker in Belmont, Massachusetts. The retailer now has 32 franchises open and operating from New Orleans, LA to Los Angeles, CA. The Society of Master Beerciege was established by and for Craft Beer Cellar to help improve our standards of beer excellence in the retail beer, through knowledge, salesmanship and hospitality. The post Craft Beer Cellar Launches Industry-Facing Educational Series appeared first on CraftBeer.com.